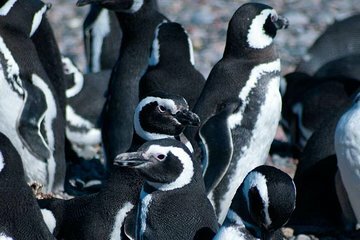 Impara a conoscere i pinguini in questo tour di 4 ore con visita a uno delle più grandi colonie di pinguini del mondo da Ushuaia. Viaggia in battello verso la colonia, navigando sul canale di Beagle e ascoltando le spiegazioni della guida. Partenze mattutine e pomeridiane disponibili. Raggiungi il tour al luogo di partenza, cioè la biglietteria Catamaranes Canoeros nel centro di Ushuaia, accanto al porto turistico, trenta minuti prima dell'orario di partenza scelto. Orari dei tour: 9:30 e 15:30. Sali a bordo della barca e parti verso il canale di Beagle, passando davanti al museo marittimo e al museo della fine del mondo. Ammira il paesaggio e le montagne Olivia e Cinco Hermanos. Passando per la Isla de los Lobos, osserva i leoni di mare rilassarsi sulle rocce. Potrai anche vedere i cormorani di Magellano che vivono sulle isole Pajaro e il faro Les Eclaireurs. Altre attrazioni includono Estancia Remolino, Isla Grande e la base navale di Puerto Williams. Una volta raggiunta l'isola di Martillo, potrai trascorrere un po' di tempo fotografando i pinguini mentre ascolti la tua guida raccontare le loro caratteristiche biologiche e di comportamento. Ritornerai al porto di Ushuaia alla fine del tour. I liked the tour. Although i took the half day tour but i still found it long and repetitive. Scenes are beyond amazing but the noise did not let us hear well the tourist guide who was ok bit not really great. That is a good oportunity to see the animals from Patagonia. The ship went very close to the animals. Even though, you will need some zoom on your camera tô take good pictures. This was a really good tour and my partner and I really enjoyed the tour. The people were super friendly and there is plenty of time to see all the islands, the nice scenery and the penguins. I would definitely recommend this tour to everyone.Now, I booked this tour through viator, that they use Tangol and then Tangol is using the local company Catamaranes Canoeros. Catamaranes Canoeros have a facebook channel and they sell this tour for $2360 Argentinian Dollars (equivalent of £49 pounds) as of the beginning of 2019. So if you book from here, you pay £20 more and when I tried to get the lower price guarantee for that, viator rejected my claim. Conclusion, you should definitely book this tour but it is better to book it straight with them and pay less money. Very nice trip to see the Penguins, however you cannot walki with the Penguins if you chose the trip. Was wonderful see the patagônia life! The trip was great but the cost paid through Viator was excessive. If you organize this tour locally you can potentially save 50 per person. The boat is nothing special, but it serves its purpose, and is clean and well-maintained. The main point is that you'll get to see the amazing sights of the Beagle Channel, which are truly beautiful. Note however that the weather can be very cold on the water - we were there last week spring and it was freezing, so bundle up. Also, we did not actually get to go ashore to walk with the penguins, so if you want to do that, you'll need to take the longer tour. Overall, it was well worth the money.